Lawn season is a golden period for ladies and as well as for designers and this is not ending any soon. Every other female is of the view to beat other female with more and more and prettiest law dresses. And on the other side there’s designers who are offering number of beautiful designs and dresses for their loyal customers who are waiting for the new collection. Let me tell you one thing that the wait is over and the brand is just launched their Mid-Summer collection for 2016-2017. We are lucky enough to live in the country where we are blessed with all four seasons and all the designers came up in the market with their designs in all the seasons to satisfy the demand of their customers. In this regard, So Kamal Fall Collection 2016 is absolutely successful in satisfying the demand of their customers. To beat the fight of lawn fever among designers, So Kamal brand just has launched their collection and the collection consists of 3-piece lawn dresses with chiffon and lawn dupatta. Some of the dresses are fully embroidered, some of them have embroidery on neck line, border or sleeves along with chiffon or net or lawn sleeves. 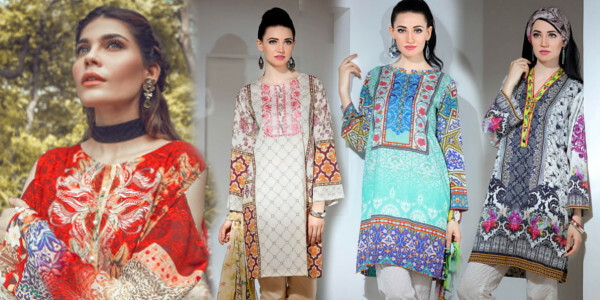 The dresses mainly consist of shalwar kameez but as they are unstitched so you can make them stitched according to your own demand like straight pants, or according to new fashion like tulip pants, long or shirt shirts with quarter sleeves or full. The dresses have fine classical printing, lining or floral printing and following the latest trend of fashion, some of the dresses has monuments printing with very fine quality fabric. There are some of the dresses which are not embroidered but digitally printed. If we talk about colour scheme than they are absolutely in accordance with the hot scorching summers and are designed to beat the heat. Light lime, aqua blue, parrot green etc. are the colours that look soothing to eyes in summers. In my personal opinion, So Kamal’s fall collection this year is so much mesmerizing that it will boost up your need to buy more and more new lawn suits. Don’t wait for anything else just grasp your favourite attires before it’s too late.